This tutorial shows how to build an entity and how to consume some out-of-band (OOB) entities in an integration scenario. You will also preview how these data entities will be consumed in various integrations scenarios, such as data import and export, integration, and OData services. This tutorial requires that you access an environment by using Remote Desktop, and that you be provisioned as an administrator on the instance. Throughout this tutorial, baseUrl refers to the base URL of the instance. In the cloud environment, the base URL is obtained from Microsoft Dynamics Lifecycle Services (LCS). On a local virtual machine (VM), the base URL is https://usnconeboxax1aos.cloud.onebox.dynamics.com. Fleet Management stores customer data in the FMCustomer table and address data in the FMAddressTable table. To access or update customer information, users must access multiple tables. Instead, you can create a business object that functionally represents customer information, and that you can use to build integration solutions. 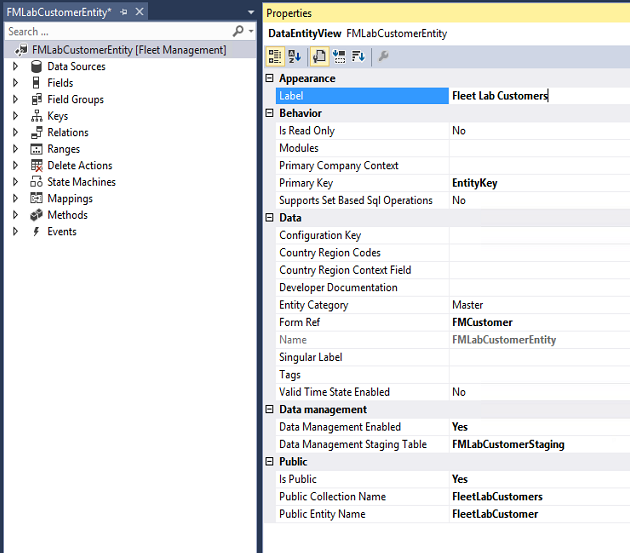 In this section, you must create a data entity for FMLabCustomer in the Fleet Management model. This entity will be used to manage master data through import/export and integration services. The primary data source is FMCustomer, and the secondary data source is FMAddressTable. 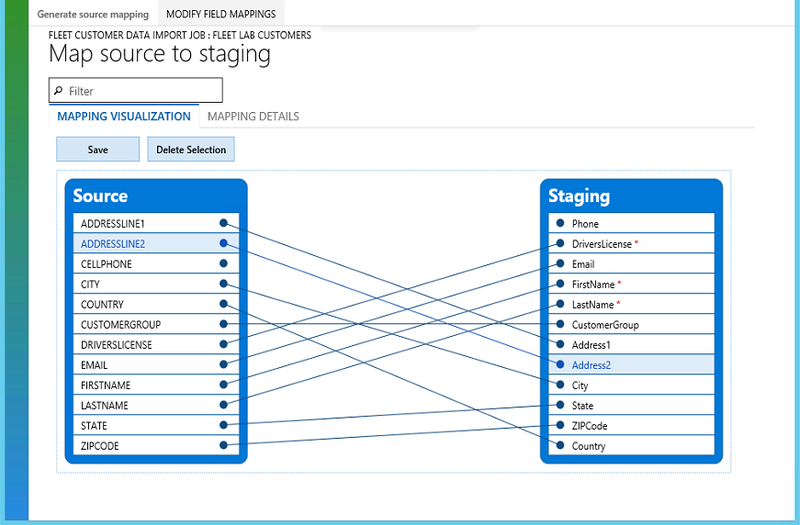 Staging tables are used in import/export scenarios to provide intermediary storage during file parsing and transformation. These tables are also used in connector integration scenarios. In many cases, staging table are mapped 1:1 to an entity. The staging table that corresponds to the FMLabCustomerEntity entity is named FMLabCustomerStaging. In Visual Studio click File > New > Project, and then select Finance and Operations Project. Right-click the project, click Properties, and verify that the project is in the Fleet Management model. If it isn't, set the Model property to Fleet Management. Create a new entity that is named FMLabCustomerEntity. Right-click you project, and then click Add > New item. The Add New Item dialog box opens. Select Data Entity, and then set the Name property to FMLabCustomerEntity. 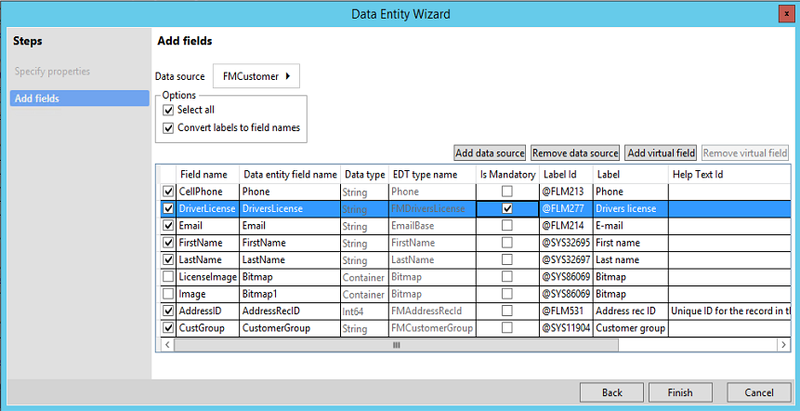 In the Data entity wizard, specify the properties for the data entity that you're creating. Use the values that are shown in the following screen shot. The name of an entity must not have '_' or any numeric digits (0…9). Using these characters may result in mapping errors later. Click Next. For more information about the function of each property, see "Categories of entities" and "Building an entity" in Data entities. 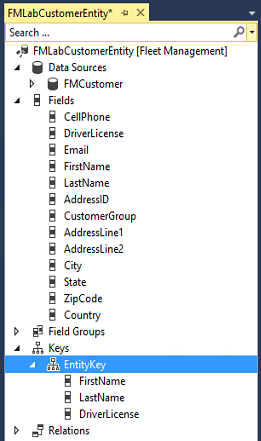 Add fields to the new entity from your data source, as shown in the following screen shot. You can add fields from the primary data source, FMCustomer. For this entity, clear the check box for the Image and LicenseImage container types to simplify testing. Rename the data entity fields to reflect public data contract standards, or click Convert labels to field names to generate names from the existing labels. On the line for the DriverLicense field, select the Is mandatory check box. This field will be used as the natural key for the entity. In the Data source field, select PrimaryAddress. Notice that the PrimaryAddress data source is automatically added because of automatic expansion or the surrogate foreign key replacement of AddressID. Click Finish. A data entity item and staging table are added to the project. In Solution Explorer, right-click your project, and then click Properties. 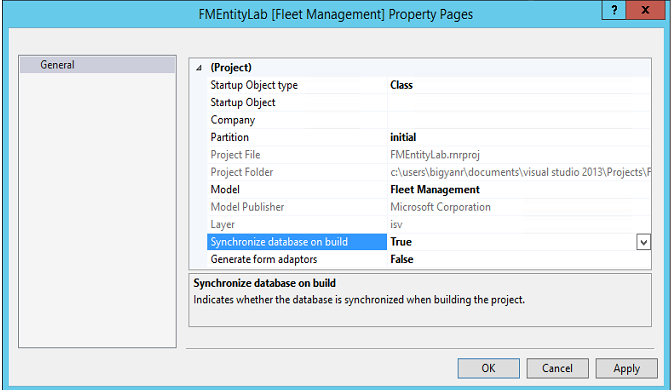 Change the value of the Synchronize database on build property to True, and then click OK. This property must be set only one time per project. 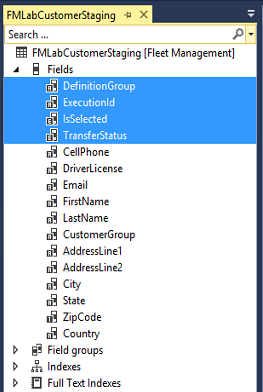 Entities are created as views in Microsoft SQL Server, and staging tables are also added. Therefore, you must sync a database when you build entities. On the Visual Studio toolbar, click Build > Build Solution to build the project. Verify that the build doesn't contain any errors. At this point in the tutorial, warnings are allowed. In Solution Explorer, right-click the FMLabCustomerEntity node, and then click Open. The designer for the entity opens in the middle pane. Validate the properties of the FMLabCustomerEntity entity. Select the entity in Solution Explorer, and compare the Properties pane values to the following screen shot. 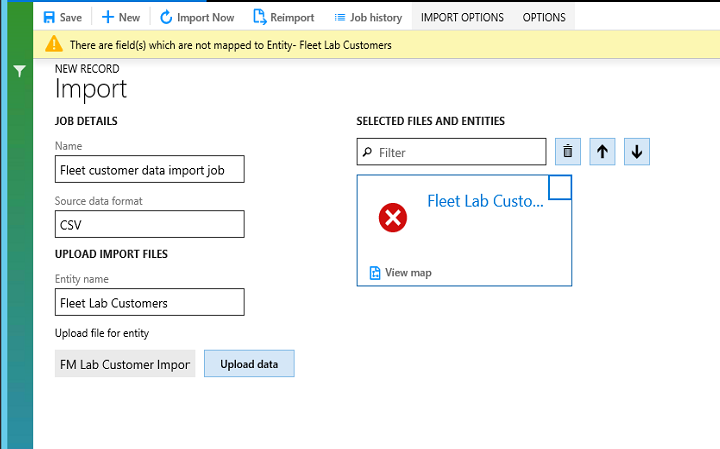 Set the Label property to Fleet Lab Customers. 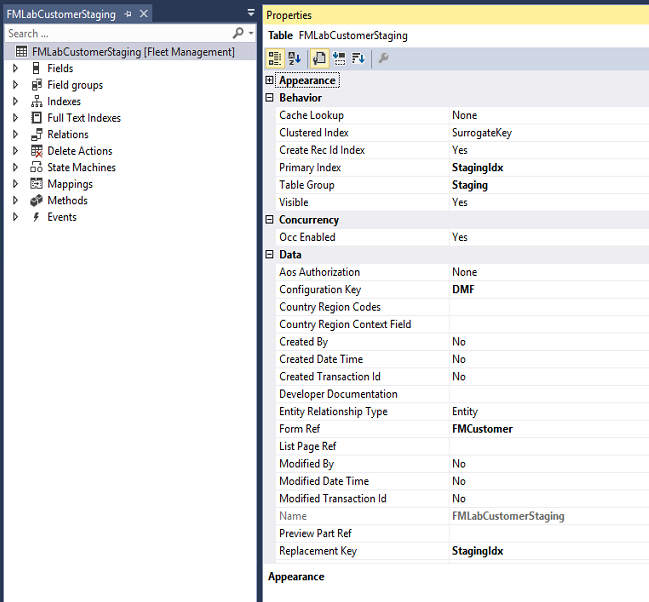 In the left pane, click Data Sources > FMCustomer > Data Sources > FMAddressTable. Change the Is Read Only property to No. This is a known issue. Eventually, the value will be set to Yes or No automatically, based on the type of join. The value should be Yes for composition scenarios, and No for associations (surrogate foreign key expansions). This property enables the data source to be read/write. 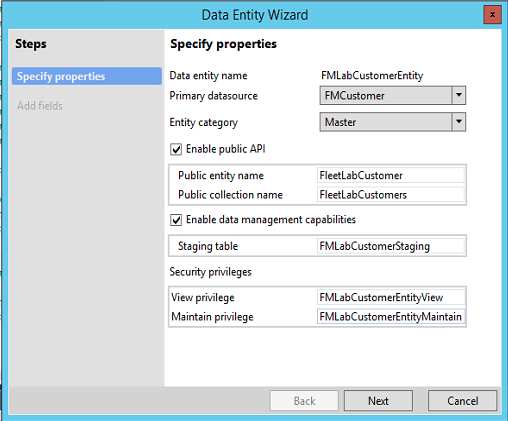 In the FMLabCustomerEntity designer, click Keys > EntityKey, and then expand the Fields node. Verify that the list of fields matches the following screen shot. To visually validate the staging table that will be used for import/export, open the FMLabCustomerStaging table in the designer, and then select the FMLabCustomerStaging node. Click FMLabCustomerStaging > Fields. In the following screen shot, the standard fields of the staging tables are selected. All entity staging tables have these standard fields. 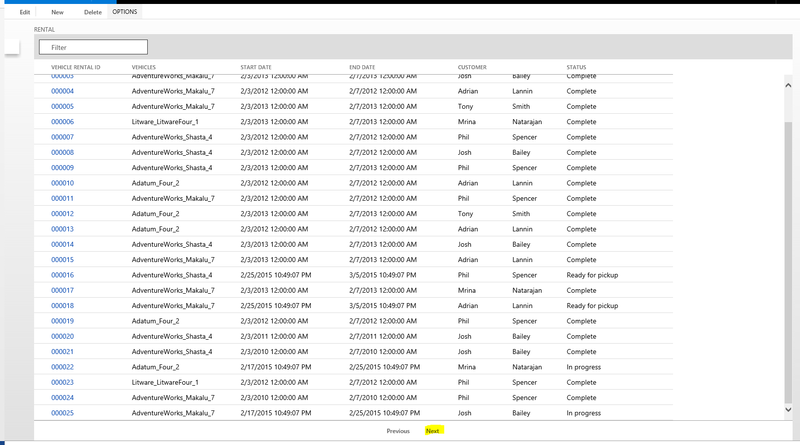 The screen shot also shows the data fields that belong on this data entity. In Solution Explorer, right-click your project, and then select Rebuild to rebuild and synchronize the project. Entities can be tested by using various methods in X++, through data import/export, or through integrations. In this section, we'll explore scenarios for validating entities. One of the most common ways of interacting with data entities is through X++, by using a unit test or a runnable job to validate that the entities have been built. In this example, we will use a runnable job. In Solution Explorer, click Add > New item > Runnable class to add a runnable class to your project. Copy and paste the following code into the class to test your data entity. Run the code in debugger to set it as a startup object. To validate the entity, view the Infolog in the debugger window or in notifications on the website. You will see that three successful messages are logged. You will also see the actions that were taken. Data entities that have the Data Management Enabled property can be used to import and export data in various file formats. 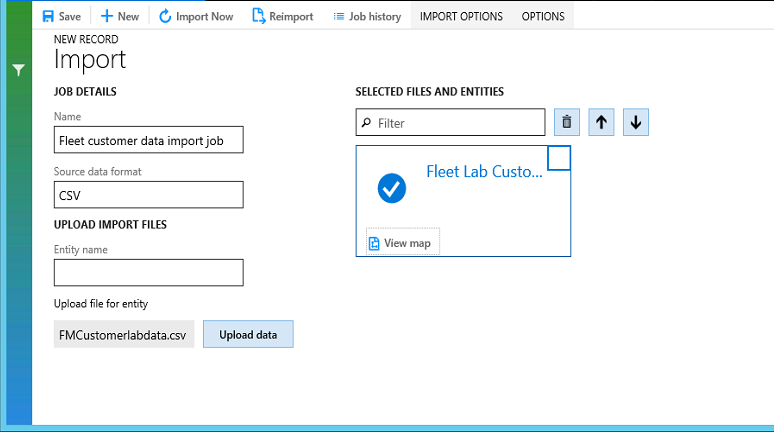 In this section, you will import data in a CSV file format for the FMLabCustomer entity. After you create your data entity, you can validate import/export. Create a sample CSV file that you can import. Copy the following text, and save it as FM Lab Customer Import.csv. Click User Dashboard > Data management. In the Data Management workspace, click the Import tile. On the Import page, enter the import details, as shown in the following screen shot. Click the Upload data button next to the Upload file for entity field, and select the CSV file that you created. After the file is uploaded, you will notice that the entity is added to the middle section. You will also receive an error that states that the mapping isn't valid. A few fields aren't mapped correctly between the source file and the target entity. In the entities list, click View map. Click the Back button in your browser to go back to the Import job page. The check mark in the entities list indicates that the entity is now ready for import. Click Import Now. After the import is completed, the job status page opens. You will review the existing FleetRental entity and then create a relationship from one data entity to another. This relationship will be used as a navigation property for OData entities. 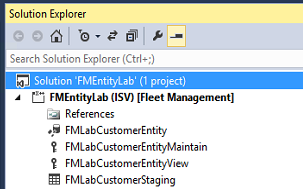 In Solution Explorer, verify that you're in the FMEntityLab project. In Application Explorer, search for FMRentalEntity, right-click it, and then select Add to Project. In Application Explorer, search for FMCustomerEntity, right-click it, and then select Add to project. In Solution Explorer, right-click FMRentalEntity, and then select Open. In the view designer, select the root node, FMRentalEntity, and review the following properties. IsPublic Yes When this property is set to Yes, the entity is visible by using the OData application programming interface (API). Public Entity Name FleetRental The name that will be used in the OData APIs for EntityType. Public Collection Name FleetRentals The name that will be used for the OData collection entity. In the view designer, expand the Relations node. Select Customer Relation, and then click Delete. Right-click Relations, and then select New > Relation. Select Relation1, and set the following properties. In the view designer, right-click the CustomerRelation node, and then select New > Normal. Right-click the new node under CustomerRelation, and then select Properties. Field CustomerDriverLicenseThis is the foreign key field on FMRentalEntity. Related Field DriverLicenseThis is the unique key on FMCustomerEntity. The following screen shot shows the relation in Visual Studio. On the BUILD menu, click Build Solution to save your changes and build the project. You can view the build progress in the Output window. To update the OData endpoint with the changes, you must run an iisreset command. Open a Command Prompt window as an administrator, and enter iisreset. You've now created a navigation property between FMRentalEntity and FMCustomerEntity. In this section, you will use some of the standard OData syntax to navigate and query the OData entities that are exposed in the Fleet Management model. First, follow these steps to enable Internet Explorer to view JSON formatted data. Close all Internet Explorer windows. Go to C:\FMLab, and select and double-click the json.ie.reg file. In the Registry Editor dialog box, click Yes. You can now use Internet Explorer to explore some OData URIs. Start Internet Explorere, and enter the following URL in the address bar: [baseURL]/data/$metadata You will see all the metadata that is associated with OData entities. The metadata might take a few minutes to appear the first time that you access it. 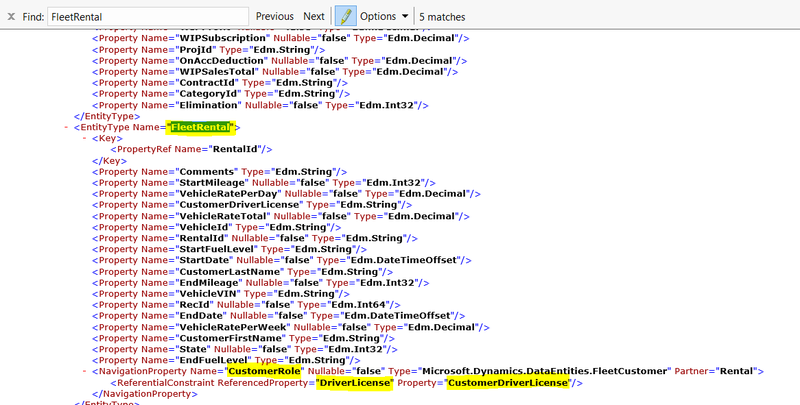 In the XML, you can see all of the properties and navigation properties associated with the OData entities. In the browser, find FleetRental. The following screen shot shows the metadata of the FleetRental entity, together with the new relationship, NavigationProperty. These URLs won't work if you copy and paste them. You must manually enter them in the address bar. To retrieve all the Rental records, together with all details of the customers, enter the following URL: [baseURL]/data/FleetRentals?$expand=CustomerRole The following example shows a Rental record, together with details of the linked customer, in JSON format. Actions provide a way to inject behaviors into the data model. In Dynamics 'AX 7,' you add actions by adding a method to the data entity and then decorating the method with specific attributes. In this section, we'll walk through the steps for adding an action. In Solution Explorer, right-click FMRentalEntity, and then select View code. Copy the following code lines, and paste them into the Code window. On the BUILD menu, click Rebuild Solution to save your changes and build the project. You can view the build progress in the Output window. The action that you just added can be invoked through code, as you will see in the next section. In this section, you will use a console application to consume the OData endpoints that are exposed in the Fleet Management application. The console application first creates a new customer and then creates a new reservation for that customer. This tutorial shows how easy it is to use OData together with standard .NET Windows Communication Foundation (WCF) data service libraries to integrate with Dynamics AX. Start a new instance of Visual Studio. On the File menu, click Open > Project/Solution. In the Open Project dialog box, browse to C:\FMLab\Odata4ConsoleApplication, and then select Odata4ConsoleApplication.csproj. Click Open. The Odata4ConsoleApplication project appears in Solution Explorer. In Solution Explorer, double-click OdataProxyGenerator.tt. In the code editor, replace the following string with your organization's URL. <baseURL> public const string MetadataDocumentUri = "<baseURL>/data/"
In the Save of Read-only file dialog box, click Overwrite. The proxy class for the OData metadata endpoint is generated. This operation might take a few minutes. In Solution Explorer, double-click Program.cs. Replace the value of the dynamicsBaseUri variable with your organization's URL. Verify that there is a final closing slash (/) in the URL, and then click Save. In the Save of Read-only file dialog box, click Overwrite. Press F5 to run the application, and then follow the instructions in the output console window. The application might prompt you for your Dynamics AX credentials. After the application has run, the new customer and the corresponding reservation are created. Start Internet Explorer, and enter the following URL in the address bar: [baseURL]/?mi=FMRental The FMRental page shows the list of rentals. At the bottom of the list, click Next to view the next page. On this page, you can see that the reservation was created for the new customer that you added. This completes the walkthrough, where you've seen an external client interacting with the Fleet Management model by using OData endpoint. During an export, the entity name and the field names are exported in uppercase. If there is a need to apply a transformation, the transformation must use uppercase in all references. During an import, data management accepts input file in any casing. However, care must be taken to have the same format for a given attribute/element in the file. When applying a transformation, ensure that the transformation is using the same casing rules in all references as in the incoming file. During an export, column names will be exported in uppercase. Imports are not case sensitive. During entity development, take care to ensure that the overall structure of the entity does not exceed the max join limit of 26. This is the default limit in Finance and Operations. Increasing the join limit is not recomended becaues it can have unintended consequences. If this limit is exceeded, the entity will most likely fail to process records and will result in the following SQL error. It is also recomended to manage the total number of columns in the entity to avoid this error.